Looks like tennis exhibition match has becoming a tradition and yearly event for IMG in Asia. 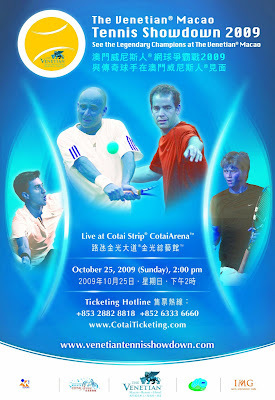 For the third consecutive year, the people in Macao get to meet tennis stars of yesteryear as well as the current ones. This time the Venetian® Macao Tennis Showdown will see the appearance of Andre Agassi and Pete Sampras as well as rising stars Yuki Bhambri and Ryan Harrison. Yuki and Ryan will be making their way to Macao this October. The fearsome and intense rivalry between Andre Agassi and Pete Sampras will be renewed at the 15,000 seat CotaiArena in their first clash in seven years. The highly anticipated match-up between Sampras and Agassi will be preceded by a 45-minute timed singles match between two of the finest juniors in world tennis. Indian rising star and ITF Junior World no.1 Yuki Bhambri will face Ryan Harrison, an American prodigy and one of two brothers scaling the junior heights. Both train at the famous IMG Bolletieri Sports Academy in Florida where Agassi trained as a junior. The third match of The Venetian® Macao Tennis Showdown will feature Pete and either Bhambri or Harrison against Andre and Harrison or Bhambri, with the pairings decided by draw at the Meet-the-Players Press Conference on October 24th. The one-day extravaganza will kick off at 2:00 p.m. on the long weekend of Sunday, October 25th. The Showdown will once again feature an online charity auction, which will offer prized personal items from both players and experiences such as the on-court coin toss, with proceeds being divided between the Andre Agassi Foundation, Sampras’ Aces for Charity Program and Make-A-Wish HK/Macau. Tickets is available for sale today (Friday, May 22nd at 10 a.m) and can either be reserved online at www.cotaiticketing.com or by phone at +853 2882 8818 (Macao) and +852 6333 6660 (Hong Kong), or in person at Sands Macao Lobby and CotaiArena™ Box Office. Ticket prices have been set at MOP/HKD $980, $780, $480 and $280. Corporate Boxes are also available. Fans can visit the event’s website at www.venetiantennisshowdown.com for further details of the event.